Ichumbi derived from the local Rufumbira dialect means ‘ a cool, comfortable home ‘. The lodging facility that is just 10 minutes’ walk to Rushaga gate of Bwindi Impenetrable National Park, has a spectacular view of the park right from your room! It is designed to provide you with high end comfort and relaxation to be able to enjoy your Gorilla tracking experience, go birding watching and enjoy forest life surrounded by impressive landscape. At Ichumbi, your comfort is our ultimate goal. Ichumbi Gorilla lodge provides 6 Luxury Cottages and 4 Budget Rooms. 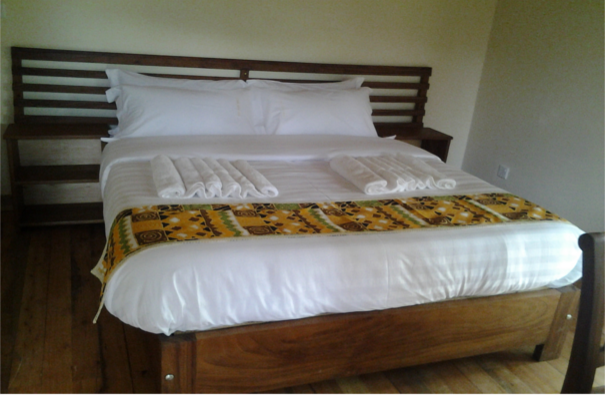 Each room has en-suite facilities with hot showers and a private balcony to enjoy the spectacular view of Bwindi forest and beautiful landscapes. Being in a mountainous country side, the lodge harvests rain water which is collected in large water tanks. Access from Kigali-Rwanda, is about 4 to 5 hours by road depending on delays spent at border crossing. Access from Entebbe/Kampala, is 8 hours by road. You can also travel by air. Aerolink operates scheduled domestic flights to Kisoro Airstrip. Charter flights can also be arranged. Contact us for transfers to the Lodge.